This Core Principles document shows all the principles involved in constructing and executing a very effective sales and marketing strategy. Imagine you’re in a rowboat, far out in the ocean. There are 10 of you, all rowing and hoping to get back to shore. 7 of you are rowing in one direction, but 3 of you are confusing and all rowing in different directions. How destructive would this scenario be toward reaching your goal? Then imagine how much easier it would be if you got everyone on the same page, rowing together in the same direction. This is what we do. We build websites, landing pages and ad campaigns for clients. But most businesses I work with already have these things in place when we start working with them. So why in the world would a business hire us to rebuild assets for them that they already have? Because the pieces they have in place are all rowing in different directions. They’re not getting the results they want, and the sales they’re getting are costing them far too much in both time and money. It’s not that you can’t make sales like this. It’s just way harder than it needs to be. Until you optimize your approach, you’ll never be able to scale. And your business eventually becomes an albatross when you choose to approach things without a strategy. The reason this dissonance occurs is because they haven’t applied the Bulletproof Core Principles. In short, the reason clients hire us is because they’re ready to stop banging their head against the wall. They’re ready to grow. There’s a lot more involved than just having a beautiful website with all the features you want. If you want that website to convert and become a meaningful asset to your business, you need to apply an actual revenue strategy that gets everyone rowing in the same direction. That’s why I’m taking the time to document everything we do here and share it with you, because this is truly what brings synergy and scaleability to your business. 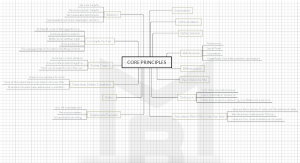 You can grab a copy of the Core Principles document here. I encourage you to print it out and review it. There’s a lot of information packed into this single one page document, so printing it is just the easiest way to have it all in front of you. After we get all the documents published, I’ll be following up with articles and in-depth explanation of each component. In the meantime hit me up with any questions or if you’d like any help executing these in your business. It makes all the difference in the world.